Powerful plant oils, organic, pure and simple. Free from synthetic, fragrance and irritant ingredients. Skin and earth friendly. Lovingly blended combining the vibrational healing energy and active botanical ingredients of plants, flowers, trees and infused with Reiki. Mindfully selected, responsibly and ethically sourced from farmers, growers and our beautiful planet. Only tested on willing humans! Cleanse, moisturise and protect your skin naturally with these active botanical ingredients to deeply nourish and feed the skin, restoring vibrancy and glow. The powerful properties of each plant oil helps to soothe, calm and heal. Natural ingredients gentle enough for children's delicate skin and suitable throughout pregnancy and nursing. When we create a ritual for ourselves we devote time and energy, a loving awareness and connection to our deeper needs. We slow down and become mindful and our ritual becomes our own self love meditation. Step 1. Begin every day with your lid affirmation – I deserve a life filled with love, good health, abundance, prosperity, success, joy, peace and happiness. Close your eyes and take three slow deep breaths. Lift the lid of your balm and inhale the beautiful natural scent of nature. connect to how you feel. Step 2. Apply a small amount of balm to your hands, allow to warm before gently massaging into your skin. Step 3. Apply a hot cotton cloth to your skin, take three slow deep breaths and gently wipe away to cleanse and refresh your skin. Step 4. 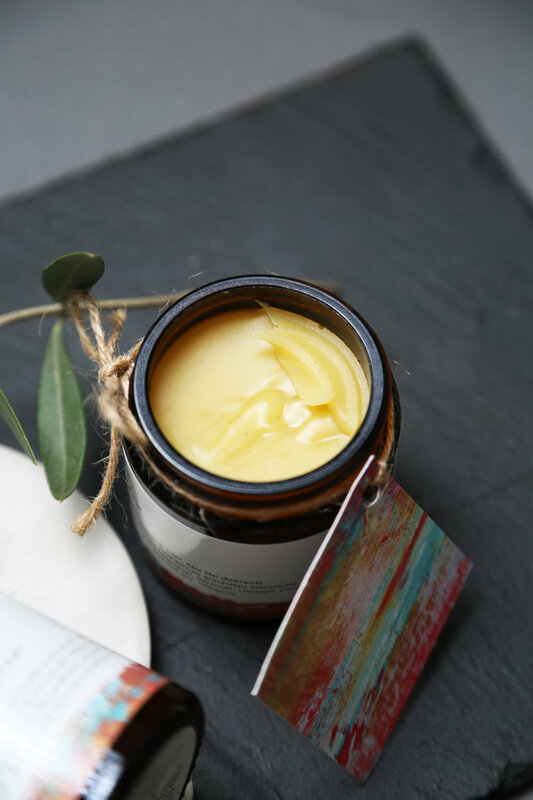 Re-apply a small amount of balm, gently massage your skin for 3-5 minutes, this increases the circulation and nutrients to the skin. Self massage can promote and nurture a sense of wellbeing and care for oneself. Step 5. To complete your morning ritual, splash your skin with cold water to kick start your day, close your pores and seal in all those natural plant oil. You are ready for your day, cleansed, soothed, moisturised and nourished. Feeling good and glowing brightly. Step 6. Bedtime ritual: follow steps 1–4, settle comfortably in your bed, take ten slow deep breaths, visualising peace and calm entering your body as you breathe in and allow your body to become heavier and heavier with each out breath, letting go of any tightness, tension, thoughts. Let go of the day and drift peacefully to sleep feeling totally cared for and loved.